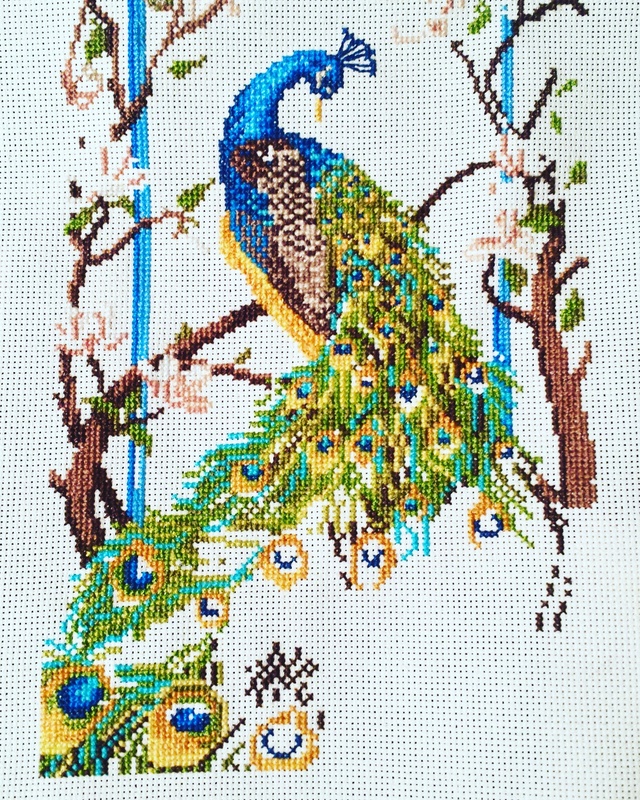 This entry was posted in cross-stitch, Cross-Stitching, Old Ways meets New Ways, Project Peacock, SAL, Uncategorized and tagged #Creative, cross-stitch, hobbies, Peacock, Project Peacock, SAL by marymargaretripley. Bookmark the permalink. oooh this is looking lovely! well done. It’s a boy. 🙂 The ladies are plain brown. – I love peacocks, this is a great project. I thought so too. Seems unfair that the boys are prettier than the girls haha! Thank you! I am making it for my hairdresser. Wow. So many colours! It’s looking amazing. You got a lot done. It is really pretty. Love the colors in his tail. Beautiful peacock! Welcome to the SAL! My name is Gun and I live in Sweden. Peacocks are so beautiful, and noisy! This is a great project, welcome Mary Margaret! Thank you Kathy! Very excited to be part of the group. Wow! Such a lot done in three weeks! You’ve definitely got a peacock. The girls are called peahens and they are boring brown. Doesn’t seem fair that the girls are boring brown and the boys are prettier haha! I did get a lot done but gardening season is starting and I might get as much done. Thank you for having me in this group! You are most welcome 🙂 The girls are probably a lot smarter than the boys LOL. Thank you Catherine! The photos don’t do him justice. It’s a sad truth that in the bird world, it’s the men who get the best clothes… His tail is looking particularly splendid! Wow lots of progress, well done. wow, you got so much done!! It’s looking great. Yep, it’s a boy. Peahens are plain brown.